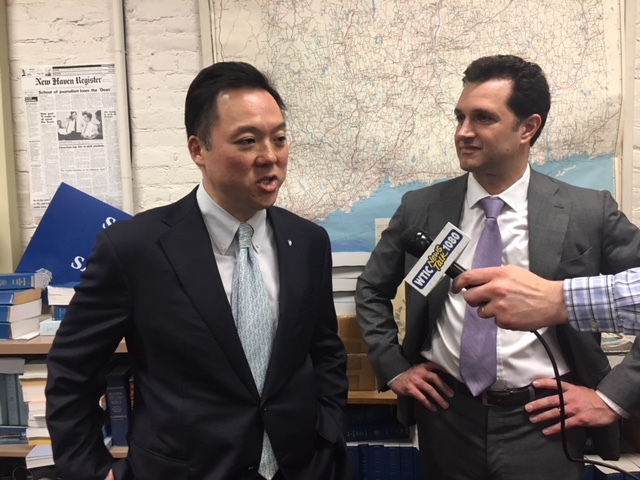 William Tong, left, and Michael D’Agostino. Rep. Michael D’Agostino, D-Hamden, a commercial litigator who quickly became an unexpected champion of progressive politics in a short-lived exploratory campaign for state attorney general, endorsed Rep. William Tong, D-Stamford, on Wednesday in the four-way race for the Democratic nomination for A.G. The endorsement is a boost for Tong, a Democrat from what had long been a Republican district who never has enthralled liberals, despite a strong progressive record on issues ranging from gun control to LGBT protections as co-chair of the legislature’s Judiciary Committee. At a recent AFL-CIO convention, D’Agostino cemented his status among progressives by winning a five-way straw poll with 47.7 percent, followed by Chris Mattei at 24.8 percent; Tong at 11.4 percent; and Assistant Attorney General Clare Kindall at 7.4 percent. Sen. Paul Doyle, D-Wethersfield, one of three Democrats in the Senate to support a GOP-crafted budget, got no votes. 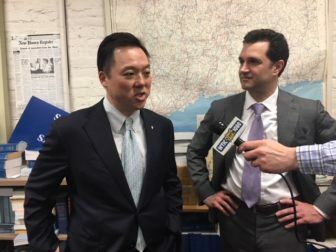 D’Agostino’s withdrawal from the race last week and his endorsement should help Tong get a new look from labor activists and other liberals who tend to dominate Democratic primaries.